Middle Eastern cuisine uses different herbs and spices in their food. In fact, there are many similarities in the popular spices used in Indian and Middle Eastern Cuisine as some of the spices were brought to India by the Persians. Spices like cumin, coriander, pepper, cardamom, cloves are extensively used in the cuisine. 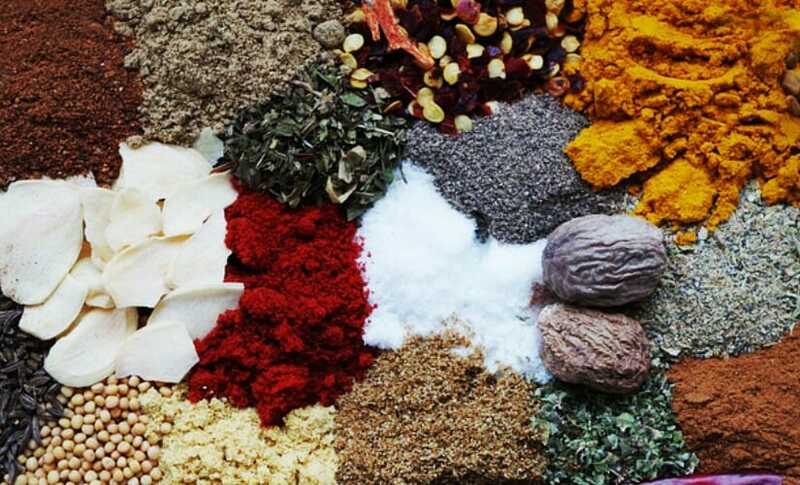 Below is a list of few popular Middle Eastern Spice blends that you can add to many dishes and bring the exotic delicacies to your table adding a pinch of spice. What is it – An aromatic mix of warm and floral spices makes this Persian spice a must have in any Persian kitchen. Advieh simply means “Spice” in Persian. Its a subtle mild spice with multiple uses to make some amazing flavourful dishes. Taste – More aromatic and fragrant and subtly sweet as opposed to spicy. Uses – Can be used in rice dishes, meat, chicken or lentils stews, grilled or roasted vegetables, and even rice puddings. Can also be used as a seasoning for eggs or used as a marinade or dry rub for meats. What is it – An all-purpose seasoning used extensively in Middle Eastern Cuisine, especially in Turkish Cuisine. The word “baharat” literally translates to”spices” in Arabic and is a blend of several spices. An aromatic spice blend without any heat, it adds a little zest to any dish be it soups, lentils, rice. meat or fish. Taste – More aromatic and fragrant with a smoky undertone. It is subtly sweet as opposed to spicy. Uses – It can be used as a seasoning for beef, lamb, chicken, seafood, and vegetables. Goes very well with rice and lentils dishes. Can also be used as a dry rub or marinade. Use as a condiment for soups, broths, dipping oil. Typical Ingredients – Black peppercorns, toasted coriander, toasted cumin, allspice, sweet paprika, green cardamom pods, cloves, cinnamon, nutmeg. What is it – An ancient blend of spices which may have its origin linked back to Biblical times. A multipurpose, aromatic spice blend, its usage is unlimited in many Middle Eastern cuisines. Each region or household make their own versions of the blend but few spices such as sumac, oregano and sesame seeds are mostly the standard spices used. Taste – Non-spicy and aromatic with subtle earthy and citrus undertones, and just a hint of nuttiness. Uses – Use to sprinkle over breads, flavour up dips such as hummus, yoghurt etc. It can be used as a seasoning for beef, lamb, chicken, seafood, and vegetables. Can also be used as a dry rub or marinade. Popularly used to season olive oil. What is it – The word “hawaij” simply means “mixture,” and is used to make a blend of spices. There are two different versions of hawaij that is used in the Yemeni kitchen. One is a savoury hawaij spice blend used for soups and stews, while the second aromatic blend is used for coffee and baking. Be sure of which one you buy as the one used for soups may have turmeric, onion powder and cumin while the baking version uses aromatic spices. Taste – Non-spicy, aromatic and earthy. Uses – Savoury Hawaij can be used for chicken soup, meat stews, beans and vegetable dishes. Baking or Hawaij for coffee is used to make coffee, milk-based drinks, cakes biscuits and other desserts. Middle Eastern spice blends are primarily nutty and aromatic. There is less use of chillies or paprika in the popular spice blends. Aromatic spices and herbs such as sumac, cumin, cardamom, nutmeg and thyme are some of the most used spices in the blends. If you wish to bring a flavourful aroma to your dishes without heat then these spices will surely bring the zing to your meal. Have you been to any Middle Eastern spice bazaars and tried spices that you have enjoyed?